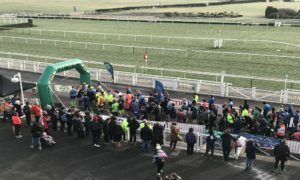 Almost 2,000 runners shrugged off the Sunday morning chills at one of the most iconic venues in the UK as horses were switched for humans in a huge race at the home of the Grand National. 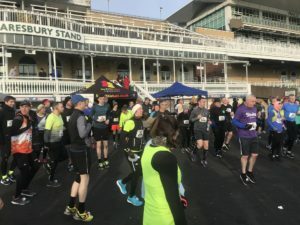 Run Aintree took place yesterday and was open to elite athletes and beginners, in partnership with R Charity, featuring a half marathon, 5K and 10K races, providing a unique opportunity to participate at the world famous racecourse. R Charity is based in Merseyside and raises funds to enable the Royal Liverpool and Broadgreen University Hospitals NHS Trust to provide the best possible health care to patients. Event Manager Rob Jowett from Run Through, who organised the event, said it was great to be joined by the charity. He told JMU Journalism: “They have been kind enough to provide 10 volunteers for the event and had lots of runners out on the course. “It can have a great effect on the body. Not only is it a physical activity, but the benefits for mental health are great. Lauren Davis, fundraiser at R Charity, told JMU Journalism: “With us needing new equipment for the trust, it’s great to get involved and get our name out there. We treat just under one million patients every year. “We want to make our facilities better so that we can improve patients’ journeys. The cash raised by supporters of R Charity will go towards breast cancer screening, stroke units and facilities for urology patients.